We are privileged to have Emily Chappell as our Lead Cyclist on Le Loop. After starting out on her cycling career as a London cycle courier, she went on to tour the world, solo and unsupported. She won the Transcontinental Race in 2016 and the Strathpuffer 24 hour mountain bike race in 2017, before joining Le Loop as lead cyclist. She is Director and co-founder of the Adventure Syndicate whose mission is to ‘Inspire, Encourage and Enable’ cyclists. What more could we ask for? You can check out her full bio here, or just spend a happy coffee break ‘googling’ her credentials. Emily will be blogging through the year with her advice on preparation and training for taking part in Le Loop. She is there to help and advise our riders, both on our training weekends and by email. Once on tour she is in charge of all our riders out on the road. That means briefing on the stages ahead, helping with technique and addressing discipline where necessary. But probably most important is her support of our riders – physically, mentally and emotionally. She’s an inspiring cyclist whose skills lie not just in showing us how it’s done, but in her ability to help others to push their limits and achieve their cycling goals. 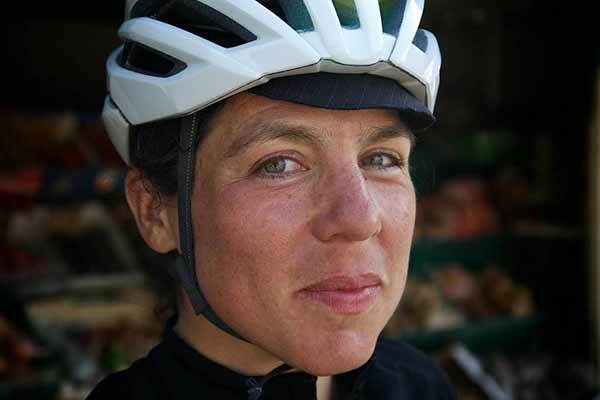 Emily Chappell is an author and long-distance cyclist. She cut her teeth working as a cycle courier in London, before setting off in 2011 to cycle across Asia, starting in Mid Wales and finishing in Japan, after crossing some of the continent’s highest, hottest, coldest and most inhospitable regions. Having developed an affection for cold weather, she’s also crossed Iceland in winter and fatbiked the Alaska Highway from Anchorage to Seattle, surviving temperatures as low as -40C. Her need for bigger and tougher challenges eventually led her to ultra-endurance racing, and she has won the 4,000km Transcontinental Race across Europe, as well as the fearsome Strathpuffer 24 hour race, commonly agreed to be one of the world’s toughest mountain bike races. Emily is a Director and co-founder of The Adventure Syndicate, a collective of outstanding female cyclists whose mission is to challenge what others think they are capable of, inspiring, encouraging and enabling people to overcome their fears and live to their fullest potential. Her first book, What Goes Around is published by Faber, and her writing has appeared in The Guardian, The Independent, Vogue and National Geographic. She is currently working on her second book (when not out riding her bike!). “I’m excited to be involved in Le Loop for all sorts of reasons. Most obviously, of course, there’s the opportunity to ride through some of the world’s most beautiful countryside (and up some of Europe’s most challenging cols) in the company of dozens of new friends and riding buddies. I get a kick out of being alongside people as they push themselves further than they’ve ever been before – and experience all the associated joy and agony of breaking out of their comfort zone and pushing their boundaries. I always thought that getting to the top of a mountain I thought I’d never be able to scale, then floating in a cloud of endorphins on the summit was the best feeling in the world, but I now know that helping someone else get up that mountain – and watching their face as it sinks in that they’ve really done it, and achieved what they thought was impossible – is even better. It’s a privilege to be part of that journey. And I can’t think of a better cause to support than the William Wates Memorial Trust. The work they do, and the charity partners they support, chime perfectly with my own ethos of encouraging and enabling other people to realise their true potential and make a positive impact on the world.